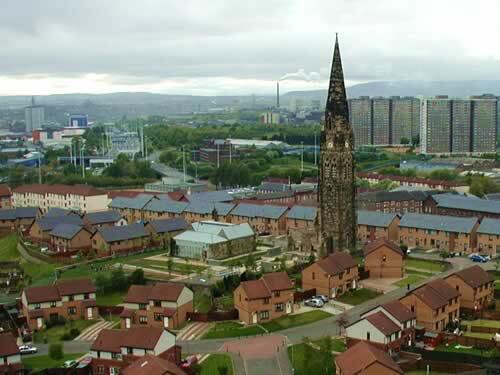 Welcome to our website about The Roystonhill Spire, Glasgow. This impressive landmark on the city's skyline was formerly Townhead-Blochairn church, and has stood watching over the city centre since 1865. You can read more about the history of the building, look at some pictures and video of our projects and view the news & news archive to see what's been happening. If you would like further information please visit our Facebook page, or . 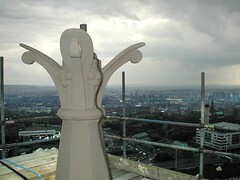 Summer 2012 - The Roystonhill Spire is now on Facebook - please 'like' our page. 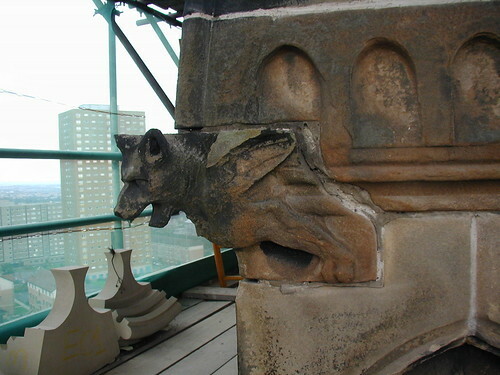 May 2010 - We have uploaded some images of the Spire when it was restored several years ago. September 2004 - Toby Paterson, a renowned Glasgow artist and designer for the Roystonhill Spire and Park Project, has launched a fund for art students to help his partner's memory live on. Gillian Purvis died after a blaze tore through a block of flats above the Clarendon Bar, St. George's Cross. See this article in the Evening Times. 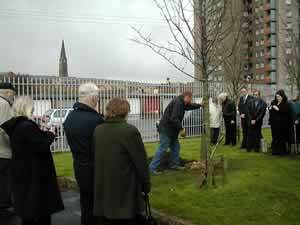 A tree has been planted in Kelvingrove Park, in Gillian's memory. 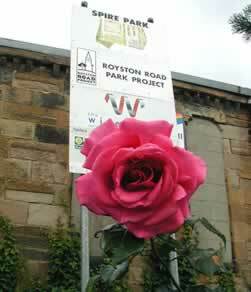 All connected with the Roystonhill Spire and Park Project would like to extend their condolences, and support toThe Gillian Purvis Trust, 11 Rosslyn Terrace, Glasgow, G12 9NA. You can also donate to the trust via their website: www.gillianpurvistrust.org. Summer 2003 - It was with great sadness that we learnt of the passing of Margaret Poole, after a long illness. Margaret was a tireless worker for the community, and the Spire & Park project could not have succeeded without her. We would like to extend our condolences to Margaret's family & friends. March 2002 - You can take a look at a summary of Stage3 of the Royston Road Project on this page, in the form of a downloadable final report detailing most of the artist-residencies and other events in this phase of the project. Movie - A 4 minute short film of the history of the project can be viewed here. It is available in two versions, for slow modem connections , and fast broadband connections . More pictures and movies of the Spire and Park will be uploaded soon.